This week I ventured south to Brunswick Heads for a day trip. See my previous post: Places that start with B: Brunswick Heads for more. This particular photograph was taken very quickly as it was school holidays and everyone was using the footbridge to cross the Brunswick River on a fairly constant basis. I was very lucky indeed to capture this without a hint of another person. Behind me, my friend was keeping an alert eye out to warn me if anyone was getting close so I didn’t block their path. No-one in front and about 5 people behind rapidly approaching! It was definitely snap and run! Well not run… more of a hobble really. It took a little while to get down on crotchety knees to get a lower perspective to try and capture the grain in the wooden boards. Took more time trying to get up than it did to take the picture! You will find Leanne Cole’s Monochrome Madness here to view her blog. Tomorrow (Wednesday) she will have a list of Monochrome participants to view. Your image really caught my eye from the monochrome madness challenge this week. Really gorgeous, that shadow in the middle is perfectly placed! I am sure it only does that for a few minutes and during a certain time of the year too. Thank you for sharing. Thanks Carrie so much. It was a busy footbridge as well so I was doubly lucky to have a clear path and then also the shadow pattern. Very impressive. The perspective is wonderful, as is the lack of colour adds another dimension to the photo. 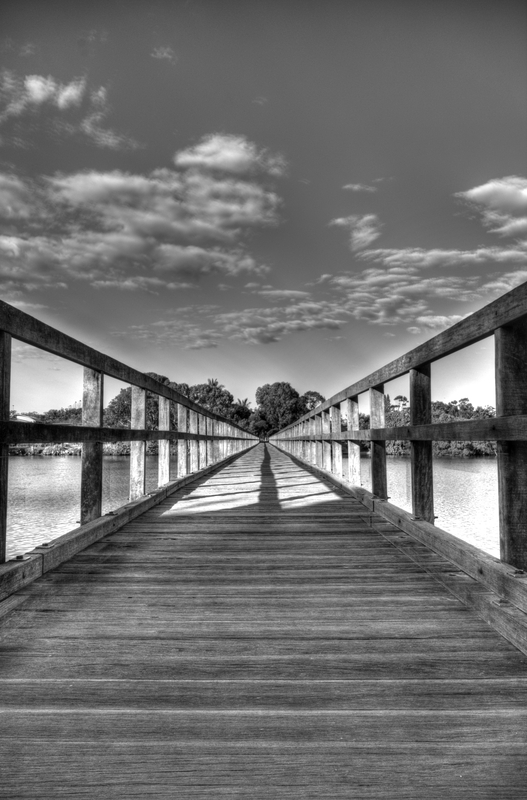 Wonderful shot, Love the converging lines, the form of the clouds, the shadows across the footbridge. Pretty amazing for a quick grab! I was pretty lucky 🙂 . I thought the lines were interesting but pure luck to be there at the time of day the shadows were forming (late afternoon) and very lucky to get the shot quickly before the foot traffic came over. I was going to give up but my friend said no try to get it! thanks as always for your kind thoughts and comments.